Any time Chris Sharma comes through an area and leaves behind a wake of difficult looking ungraded boulder problems it’s always interesting to see what subsequent repeaters think about the problems. Take his well publicized trips to Arkansas for example. Most of the problems featured in Dosage 3 have been repeated at this point with Witness The Fitness (V15? , repeated by Fred Nicole and now broken) and King Lion (V12, repeated by Dave Graham, Ethan Pringle and others) being among the more notable. However, one of the cooler looking lines that had yet to be repeated as far as anyone can tell was a problem called The Zone. Unrepeated until this past weekend at least. 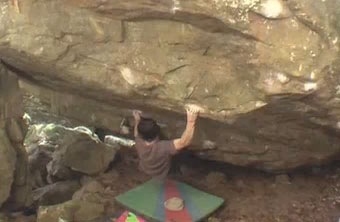 Webb also repeated One Inch Pinch (V12) and Daniel Woods’ Fred’s Cave link-up PCP, suggesting it might be closer to V12 than V13. a repeat of Lost in the Hood might be newsworthy. any name on the v7? looks really good. the v7 is called the “Stepchild”… very cool boulder. The whole zone area is neat, as it is in a steep “gorge” and all the boulders are river boulders. Now, geologically speaking, the river is a creek and all the boulders are exposed. Psyched to see this line repeated… makes it look casual. Agree with B3 on lost in the hood. Even D Woods was unable to send this problem correct? Narc you have any idea if Webb tried it?